Osmosis: Neuraminidase inhibitors. (2019, April 20). Retrieved from (https://www.osmosis.org/learn/Neuraminidase_inhibitors). Zanamivir (trade name Relenza) is a neuraminidase inhibitor used in the treatment and prophylaxis of influenza caused by influenza A and B viruses. Oseltamivir (trade name Tamiflu) is an antiviral medication used to treat influenza A and influenza B (flu), and to prevent flu after exposure. The medication is taken orally. Neuraminidase inhibitors block the function of viral neuraminidases of the influenza virus to prevent its reproduction by budding from the host cell. Unlike the M2 inhibitors, which work only against the influenza A, neuraminidase inhibitors act against both influenza A and influenza B. 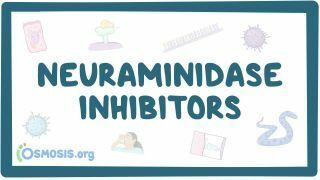 What is the common suffix for viral Neuraminidase inhibitors? A 70-year-old man with a history of asthma comes to the community clinic in January with one day of fever, headache, myalgia, and malaise. The patient states that he was healthy up to this point, and that a week before he visited his daughter and grandson, who were both sick with similar symptoms. Because of the patient’s age and chronic respiratory condition put him at high risk for complications, the physician decides to give him antiviral medications due to duration of symptoms. Which of the following drugs is the best option for treating this patient?